A security deposit of $250 is also required and will be authorized on your credit card 7 days prior to arrival. A charge may result for damage to the condo, missing contents, keys or for exceeding the number of allowed overnight guests. There will be a $50 charge for loss of a pool access key card and a $250 charge for loss of a second key card. Luxurious condo designed to meet the needs of the most discriminating guest. We rented Na Hale O Keauhou Townhome I-3 for 8 days. 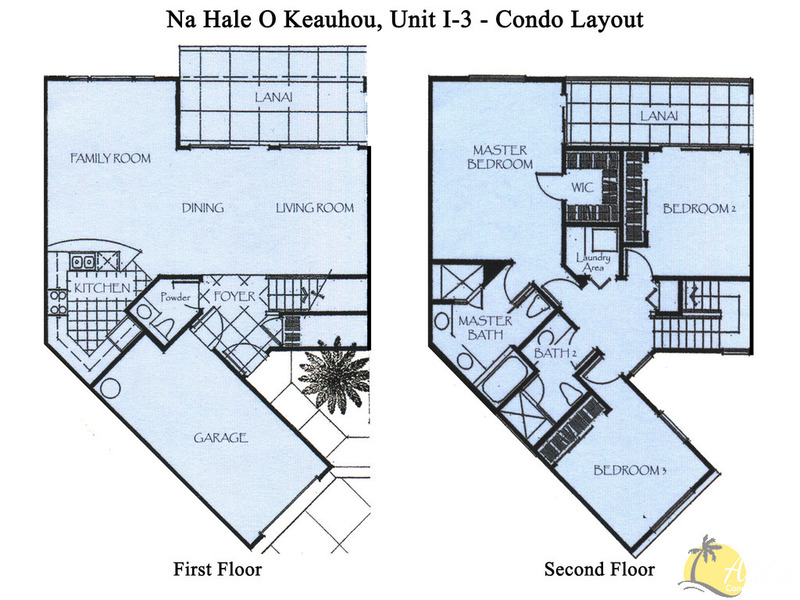 The location is convenient to everything on Ali'i drive and the Keauhou Shopping Center. We ventured down to 2-step for snorkeling using the bypass road, which saves a tremendous amount of time rather than taking the scenic upper highway. As prior residents of Kona (10 years) we had specific things to do and accomplish, this location was great for everything. We also enjoyed the pool and community BBQ. The view from the condo is fantastic. The condo is sufficiently stocked with small appliances, cooking apparatus (including the almost mandatory rice cooker - no Hawaiian house is without one!) and beach/water activity items. We highly recommend unit I-3 to anyone who is seeking a comfortable, convenient location with a killer view. This is a definite go back for us, mahalo for sharing your awesome condo. Thank you very much for letting us rent you beautiful town home. It was perfect for us and it made us feel like being home. It was very neat and clean and it made it hard for us to touch your nice decorations around your home. Though, we only used your oven twice, it was great to make our own dessert for a Christmas Party we attended. The quietness made it comfortable to sleep in and wake up later then we are used to. Please keep my name on your list. I would gladly rent this home again when I am in Kona. May you have a safe and happy new year. We have stayed at NaHale O many times and this was the 4th time in this condo. It is a very well maintained and comfortable unit and Catherine has thought of everything for a great stay. The complex is beautiful and very well maintained. A grocery store is right up the hill and it is a short walk down to the ocean to see sea turtles on the beach. I've vacationed in the Keauhou area dozens of times over the past 25 years, always staying in condominiums, but this was our first time in Ha Hale O'Keauhou. I must say that this unit is already among my top choices! It is certainly well-appointed - beautifully furnished, exceptionally clean and had everything we needed - literally! It got to the point that we didn't even wonder if it had something. Instead we would say "I'm sure there is (fill in the blank) - around here somewhere!". Catherine has obviously put a lot of thought into the comfort of her guests and what they would find helpful! 2 beautiful lanais and a beautiful view of the ocean! Some mornings we could hear the surf, even though we were across the street from it. The complex was definitely the quietest that we have ever stayed at, the pool was gorgeous and the exercise room was well-equipped too! We will definitely return! We have stayed at Nahale O'Keauhou many times over the years, and this last Christmas did not disappoint. Townhouse I-3 is beautiful and was perfectly set up. Our kids live in Kona and we had most of the dinners over at the townhouse as well as celebrated Christmas there. Plenty of room for everyone. The furnishings and set up was wonderful. The kitchen had everything you needed to make meals for 10 plus. The access to the pool and BBQ area was perfect and the convenience of being able to walk up to the Keauhou shopping center is always a plus while staying at Na Hale O'Keauhou. We will certainly be back and would recommend this town house to anyone. I-3 is an amazing condo rental. It is in the best location in South Kona with easy access to Keauhou Bay, nearby groceries and gas station, and all that Kona has to offer up alii Drive. The condo itself is very modern, extremely well supplied, and furnishings are practical and in great condition. The local contact was also very helpful if there is ever a question or a problem, prompt and friendly all the time. I plan to stay many more times in the future! The view is so much better than we expected, so I've added a picture. From both lanais there is a visible green space that allows you unobstructed views right to the coastline. Once again we had a wonderful stay at Na Hale O and our second stay in this unit. Na Hale O is a beautiful, well maintained complex. This unit is clean, comfortable and has everything you would need for your stay. Thanks again Catherine for the stay in your lovely Hawaiian home and the fruit basket. We can't say enough good things about aloha Condos website which we have used many times in the past several years. We enjoyed our stay in this wonderful condo. It was clean, spacious, quiet, beautiful and equipped with everything needed for a great vacation experience. The floorplan is perfect. We hope to be back next year as we love staying at NaHale O. This unit is ideally located in a quiet part of the beautiful complex.It is uniquely furnished to provide luxury and appeal to the guests. It provides all the comforts of home and we enjoyed every minute. It is close to excellent restaurants, snorkeling beaches and golfing. It provides a beautiful view of the sunset from the lanai. The pool and workout room are beautiful should you decide to relax at home for the day. It is definitely an excellent value. Stunning condo in prime location. A beautifully decorated 2 story condo in a quiet location close to beaches and a small shopping center. Gorgeous master suite and master bath.Immediate attention to minor requests by local management. Welook forward to returning in the near future. The most amazing place to stay in Kona!! !